Just got my 540 installed the other day and have been wringing it out and getting used to the interface. Yesterday, I tried my first VTF ILS and things did not behave as expected. Could somebody please clarify when and how the GPS to VLOC changeover happens? When do I activate the approach? I may be mistaken, but it did not seem to me that the "activate approach" button was always there even after selecting the approach and VTF. I am very acquainted with how the Garmin 530 handles these, which definitely had its quirks. Vectoring was normal on the approach and LOC intercept occurred well outside the FAF. Also, a related question: Does one have to manually switch back to GPS from VLOC if flying the published miss? The active IFD nav mode is displayed in green along the right edge of the top data strip. The armed IFD nav mode, if there is one, is displayed in blue along that same top strip. When there is an armed state, the nav source is depicted per the image below. As the armed mode is captured, the previously active nav mode lamp will extinguish and the previously armed state will turn green and begin to flash. The flashing should last approximately 5 seconds and the nav mode will not actually change until the flashing stops and the indication becomes a solid lamp. The active leg is part of the approach. The Activate Approach button is displayed if either the next downpath approach in the flight plan is preceded by a discontinuity (gap in flight plan) and the aircraft is within 40 nm of the FAF OR the next leg of the flight plan is the first leg of a published approach and there is a discontinuity or a Vectors-To-Final arrival selected. Automatic mode switching to VLOC (e.g. GPS à VLOC transition) including automatically setting the inbound course, will occur if the capture criteria defined above are met and the primary nav frequency can be auto-identified. If auto tuning has not been enabled on the setup pages, or a station cannot be identified, automatic mode switching will not occur. Exception to Automatic Nav Mode Switching If VLOC mode had been previously manually selected to be the nav mode (e.g. 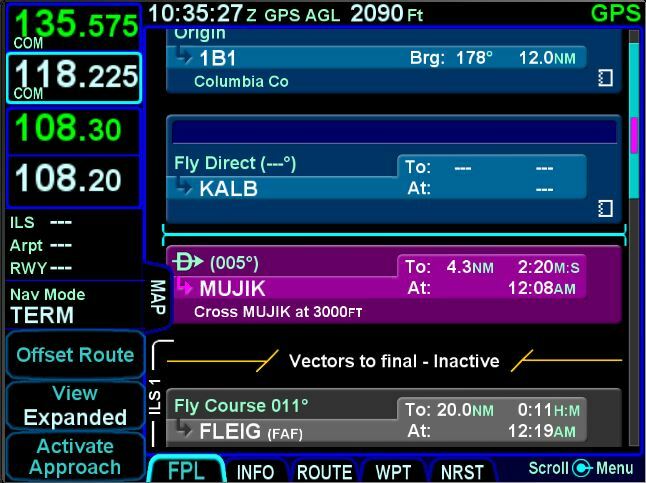 cross-tuning a VOR) and then an approach is activated in the flight plan that would have normally resulted in a GPS à VLOC nav mode indication, the nav mode will NOT toggle to GPS à VLOC. Instead, it will stay at VLOC since it is assumed the pilot intended to keep using the previous function. Likewise, the approach nav frequency will be inserted into the #1 standby nav frequency slot but not the active nav frequency position. Both the nav mode transition and the swapping of the nav frequencies will have to be manually performed by the pilot. And the system will automatically toggle itself back to GPS on the missed approach. In the example above, if the pilot selected Direct To one of the waypoints in the approach that was loaded or turned the nav source knob to GPS, would that send it back to GPS mode and then auto switch if meeting the above criteria? What is the criteria for getting the system back into GPS mode after tuning a cross radial. Yes, I've re-read this section several times and thought I had met all the criteria listed. I will try again this afternoon. If I understand correctly, the top right annunciator will go from GPS to GPS>VLOC to VLOC by itself (if the stated criteria are met). Is that correct? Looking at the criteria, it looks as though all would be met during the turn on to the localizer on a normal VTF ILS. Also, is it normal to get the "GPS Overlay Not Authorized" warning on every VTF ILS? LOC based approaches can NEVER have a GPS overlay, so yes, you will always get that message for any ILS approach. Can we get some sort of annunciation when the GPS->VLOC transitions to VLOC? The reason is that often you need to switch the autopilot into an APPR mode co-incident with that event. Perhaps a voice alert "VLOC mode", THAT would be cool, along with perhaps a LOCALIZER ALIVE call. That is what I would have assumed. I just think it is odd logic that, if something is never true, to issue a warning in every instance. Wouldn't it make more sense to just put something in the manual to the effect that "GPS Overlay Never Authorized on LOC or ILS approaches"? Too many needless warnings dull you to the importance of "real" warnings. I flew the same approach today that caused me problems yesterday -- the ILS RWY 01 at Albany, NY. Today, everything worked perfectly. The only thing that I know of that I did differently was to manually tune the LOC frequency. I suspect it did not autotune correctly yesterday and I didn't catch it quickly enough. Now, I notice that one of the criteria that Steve quoted out of the manual was that the 540 has to recognize and correctly decode the morse identifier. The KALB morse identifier on the LOC is barely audible under the best of circumstances and has been that way for years. Maybe the fact that the same frequency serves both runways is a factor, I don't know. The question is, what does the box do if it can't decode the identifier for some reason? We're required to present that Overlay message. We would love to get rid of it but we don't have regulatory latitude to do so. As for the last behavioral question, if the decoding of the localizer identifier isn't successful, the auto mode switch will not occur and it needs to be done manually. I'm on a commercial flight right now so can't double check but there is a "Check Navaid Identifier" message that may get displayed in that event. We are enhancing that message as part of Rel 10.1 but someone with pilot guide access can check on that message trigger. I fly the ILS 01 into Albany frequently, but I come directly from the south so I'm aligned for the most part with 01 into MUJIK and it will automatically arm GGPS --> VLOC, then auto switch to VLOC mode. If you have any issues, or are unsure if the unit will switch to VLOC mode, simply manually swap over to VLOC mode. I will often do this anyway as I'm impatient and am already on a heading mode to intercept the final approach course and just want the boxes set up at my convenience. I checked the Pilot Guide Appendix Steve mentions and it says the Check Navaid Identifier CAS message will appear if the Morse code does not match the identifier of the approach Navaid. The PG does not mention this message occurring if the Morse code is unavailable or unreadable by the IFD. As part of Rel 10.1 in the spring time, we added that extra check if Morse code is unavailable or unreadable to the message trigger. When the annunciator says GPS>LOC, what source is driving the needle on the HSI? And, do I understand correctly that the GPS can get you established on the localizer and you either need to get an automatic switch, or if not, switch manually to VLOC before the FAF? Gring, what do you do if ALB approach says expect vectors to the final approach course and you punch the vectors button and then they say maintain 3000 until MUJIK? In the past, my iPad has been my friend, but is there any better way to deal with this on the 540? I wonder about your comment, as decoding the morse for any navaid is operationally required, and for an approach in particular could be deadly important. I actually quite appreciate the auto decoding. Hopefully we will get the HDG mode back in the IFD540 soon, it was pulled due to anticipated certification delays. That will simplify an ILS intercept. I quite understand the requirement to identify the morse identifier manually, and that that has not been superseded by the auto decoding thing. Fair enough. An optional override (or dismissable CAS) would be reasonable. Rolfe, I try to avoid VTF and fly a full approach, or the approach from a fix. I do this for several reasons, not least is here in the NE there are a lot of training controllers and I've had on more than one occasion where they gave me an altitude lower than the published approach segment. I don't want to have to check my work, and check their work too, so I take a more conservative approach and fly the approach plate. If a controller says maintain 3000 until MUJIK, then you either accept that ATC instruction or request what you want. I would request cross MUJIK at 2600 or say unable. You want to be able to have a stabilized approach by FLEIG (1900) and if 3000 at MUJIK won't do it, then you need to ask for what you need. The issue with 3000 at MUJIK is that it will put you above the glideslope and depending on your autopilot, it may or may not capture the glideslope with or without manual intervention and if you are hand flying it, you'll need to make a descent correction to get on the glideslope. I haven't had that instruction flying the ILS01 and I use that approach for demos quite often. I may be missing the point of your question, but from purely an FMS interface perspective, why can't you just pull up the flight plan, touch the screen right before FLEIG, add MUJIK as a new waypoint in the plan, fill in the waypoint details to cross MUJIK at 3000, and go direct to that waypoint? That was exactly the point of my question, and I'm delighted that it is so easy to edit in the FMS to insert a previously erased waypoint on the fly. However, that's not how the clearance usually goes. Normally I'm told to expect vectors for the sequence, then, depending on traffic, vectored onto the localizer outside MUJIK, then given a crossing restriction at MUJIK while inbound on the localizer. Of course, once you activate vectors to final, MUJIK is erased. This happened with the Garmin 530 as well, and my question is whether the 540 offers any better means of coping with this kind of situation. Does anyone have a checklist for setting up approaches in the IFD540... e.g., one for ILS, GPS, etc.? Mark - I just purchased an IFD540 and have a KAP 140 autopilot. Trying to get up to speed on how to most efficiently use them together. Looking for the same thing you were looking for over four years ago. If you have any information (ie. your basic chekcklists) you could provide it would be most appreciated. P = Preset bugs for the missed approach for initial altitude, heading, VSI, etc. Others may disagree about the P, preferring to set the altitude bug for the DH/MDA. I personally don't think you should need any reminders for that. Anyone so absent-minded that they are going to fly into the ground if they don't see the runway is probably not going to be much deterred by a small bug that neither lights up the panel nor sounds any alerts. Having bugs preset for missed approaches makes it easy to make the transition from approach to missed on the autopilot for single pilot IFR. Set either the published missed bugs or bugs to conform to an ATC instruction for going missed. I personally don't think you should need any reminders for that. Anyone so absent-minded that they are going to fly into the ground if they don't see the runway is probably not going to be much deterred by a small bug that neither lights up the panel nor sounds any alerts. I think this is a little harsh. Everyone should use the checklists and methods that work best for them. Labeling someone as "absent minded" because they use a different method than you, just isn't necessary or helpful. Please take another look at my post. I did not say someone who uses a different method is absent-minded. I said someone who flies into the ground on an instrument approach is absent minded (i.e., fatally distracted doing something else at the excruciatingly wrong time). I don't think that's harsh. What I also meant was that for someone so absent-minded, I don't think a small bug - that neither sounds an alert nor flashes any lights - is going to get the attention of someone so distracted they are unaware that they are about to hit the ground. So for the vast majority of pilots who remain focused on altitude the closer to the ground they get, the bug might have better uses than to remind them of something that already has their full attention. I'm not arguing that setting the bug on the decision height is wrong in any way. My technique differs for reasons I posted, but it's only technique - not procedure. Fair point. Clear now. The bugs are all belts and suspenders that folks should use as they wish to stay safe. Personally, my system talks to me as I approach DH and then resets to the missed altitude if I then climb out. PS: I've been away for awhile, so just getting back to the forum. Coincidentally, I was reviewing the Instrument Procedures Handbook (2017 version) yesterday looking for step-down fix guidance. I came across a paragraph that was discussing how to properly set up for and fly an instrument approach, and found it recommended setting the altitude bug for the missed approach altitude, not the DH. Again, technique only - and the book did not offer a basis for its position.